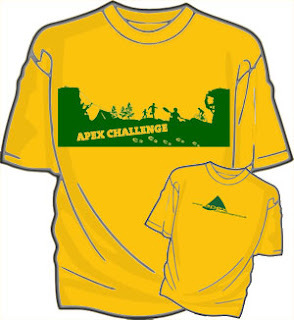 2010's brand new Apex Challenge T-shirt design has now been revealed complete with a specially commissioned image. The design by Nancy Alford is a landscape scene that aims to sum up the range of thrilling activities you might expect to be tackling at an Apex Challenge competition. The green printing on a gold coloured t-shirt is a bold combination that we hope will get you noticed when wearing it. On the reverse is the Apex Challenge website address, again printed in green. Only those taking part in our 2010 competitions will be able to get hold of these t-shirts. In the past almost all the teams have been wearing them and many Scouts say they enjoy wearing them at other events for many months afterwards as well. If you didn't pre-order yours when you entered the event then it's still possible to get your hands on one. They're just £5 each and you can contact us to place your order. There'll also be some spares available at the event, but to avoid disappointment make sure you pre-order yours in advance!